Impressive laterite and sandstone pyramid. The lack of surviving carvings leaves it artistically uninteresting, but it is the tallest scalable temple in Angkor Thom, providing a nice view from the top. The western staircase (at the back) is the most easily ascended. 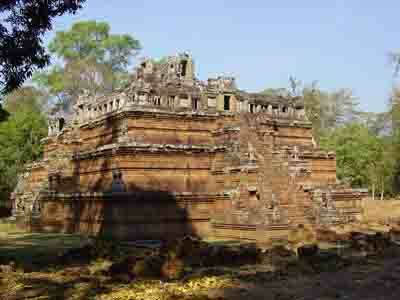 Located inside the ancient Royal Palace compound, Phimeanakas served as the king’s temple. Legend has it that the golden tower crowned the temple and was inhabited by a serpent, which would transform into a woman. The kings of Angkor were required to make love with the serpent every night, lest disaster befall him or the kingdom.